The highly-anticipated Inspector General report is headed to Congress according to three sources, reports Politico. 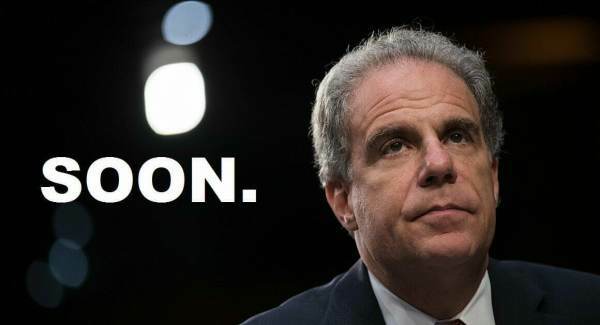 Although Inspector General Horowitz declined to comment on the time frame of the release of the report, it may be released Friday. Normally an Inspector General releases a report after turning it over to lawmakers. The Department of Justice’s inspector general is expected to transmit to Congress on Friday a hotly anticipated report criticizing former FBI Deputy Director Andrew McCabe’s disclosures to the media ahead of the 2016 election, according to three sources familiar with the timing. The report from department’s internal watchdog formed the basis of Attorney General Jeff Sessions’ firing of McCabe last month, less than 48 hours before his scheduled retirement, a decision that pleased President Donald Trump and White House allies who have long portrayed McCabe as compromised by anti-Trump bias. But while the IG report has long been expected to emerge this month, its release on Friday — as Trump lambastes former FBI Director James Comey as a “slime ball” — offers the president a potentially potent source of pushback against current and former Justice officials who have helped propel a Russia investigation that’s edging ever closer to the president. The office of Inspector General Michael Horowitz declined to comment Friday on the time frame for transmittal of the report to Capitol Hill. Under normal circumstances, the IG would publicly release its report after sending it to relevant senior lawmakers. The Inspector General’s report on Fired FBI Deputy Director Andrew McCabe is only part of a larger report on misconduct by the DOJ and FBI. While the report by Horowitz may be damaging to Deep State operatives in the FBI and DOJ, he does not have prosecutorial power which President Trump has very vocally criticized. McCabe was fired by Attorney General Jeff Sessions just hours before he was set to retire for ‘lack of candor’ and two other reasons. There needs to be a second special counsel appointed in order for there to be any hope of justice. The post Highly-Anticipated Inspector General Report on McCabe Headed to Congress – Release Imminent appeared first on The Gateway Pundit.